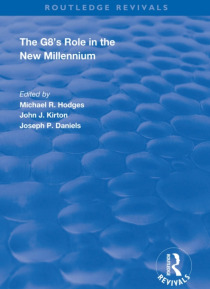 First published in 1999, this collection combines the talents of leading scholars and analysts of the G7/G8 from several disciplines and regions. It is the product of two conferences: Explaining G8 Effectiveness and Jobs, Crime, Money: Challenges for the G8 in 1998. The contributors are all senior figures from the three global regions represented in the G8: Europe, North America and Japan. The inc… lusion among the editors and authors of those with widely varying views on the G8 and from differing disciplinary perspectives ensures that this work will present a poignant and productive debate rather than a strained consensus.